This epidsode focuses on alternative packaging for wine. We discuss aluminum cans and bottles, tetra-paks, Bag in Box wines and other alternatives to glass bottles. 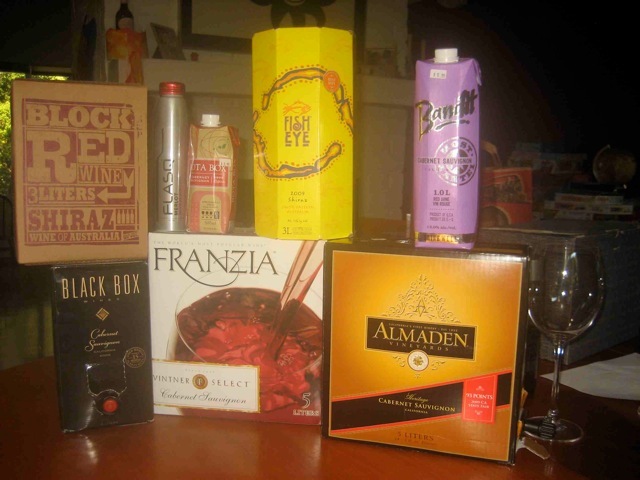 Box Wine was invented by Thomas Angove, a winemaker in Australia. As a result Box Wine is well received in Australia and has gained acceptance in Europe as well. In fact Bag in Box wines represent 45% of all domestic wine sales in Australia. The story in the U.S. is less cheery. Box Wines have not been able to escape the image of poor quality wines, made to offend the least amount of people. We took a little heat from the wine ladies when we asked them to participate in evaluating the wines, as they showed the prejudice that many wine drinkers in the U. S. can express towards wines offered in a vessel other than the traditional glass bottle. The payoff for the ladies was that they got to pick the featured wine for the next show and they chose Pinot Noir. A fine choice, since we feel that Pinot Noir is perfectly suited for the foods we enjoy during the fall and winter months. We uncovered several standout Pinots for that show and we look forward to sharing our discoveries with you. The equivalent of four bottles in one easy to store and use container and the fact that unused box wine stays fresher for longer than wines bottled in glass make Bag in Box wines a viable choice for consumers. Lower manufacturing and shipping cost and a smaller carbon footprint make Bag in Box programs attractive to many wine producers. For this show we tasted nine wines. As always we're looking for wines that offer good character/ flavors, that are true to type and represent a good value. Hey, who knows, maybe we'll find a wine that you could put in a decanter that will be good enough to fool one of your know it all wine friends. A big Thank You to all our listeners. We appreciate the support!